The potential for eye (ocular) irritation of the product was analyzed. Based on an advanced in vitro methodology, this test reliably determines the irritancy potential of substance on ocular tissue. The cytotoxicity (toxic effect on cells) of the product was analyzed based on the ISO 10993-5:2009 in vitro method. Remarkable reduction of inflammatory agents – Interleukin 8 (IL8) and 6 (IL6) – by as much as 72% and 60% respectively in 8 weeks. The maximum ocular irritation score of the Product was determined to be 4.8, which places it solidly in the safest classification. The skin is perfectly healthy. No presence of potential cytotoxicity; the product is considered safe for application on skin cells. * The study of this product was conducted by an independent laboratory to verify the anti-bags (puffiness) efficacy through the evaluation of its regenerating activity on human endothelial cells, and the evaluation of the anti-inflammatory action. Moreover, the evaluation of its cytotoxic potential was conducted, as well as the evaluation of the potential to cause ocular irritation. Exceptional Anti-Wrinkles, Anti-Puffiness, and Anti Dark Circles. CHOLLEY PHYTOCELL Eye Contour Cream, is a very effective and complete cream, especially formulated with our exclusive IC-RAMP® Technology, for problems of wrinkles, swelling, and dark circles. It is rich in Swiss phyto stem cell extracts, phytobiological actives, emollients, and hydrating factors. 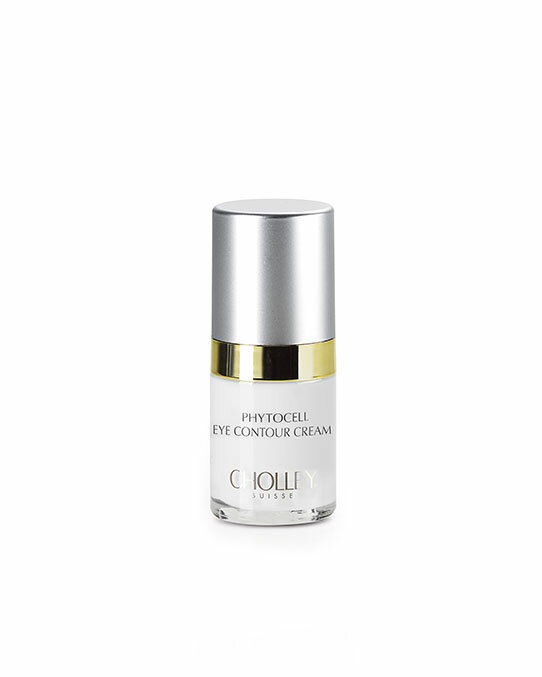 CHOLLEY PHYTOCELL Eye Contour Cream, is exclusively for use on the skin of the periorbital (eye contour) and temple regions. It helps keep the skin smooth, firm, elastic, and wrinkle-free. The product is excellent for men and women of all ages. It holds back wrinkles, diminishes the visibility of dark circles, and reduces the puffiness of the eye contour area. CHOLLEY PHYTOCELL Eye Contour Cream uses the stem cell extract of Symphytum obtained from Symphytum officinale, one of the oldest known medicinal plants with healing, anti-inflammatory, and soothing properties. Tests with tissues extracted from elderly subjects, have proven to be particularly notable, for building a thicker and smoother epidermis, with a higher content of hyaluronic acid. CHOLLEY PHYTOCELL Eye Contour Cream also reduces congestion by improving the skin’s capillary circulation, which helps eliminate excess fluids. As a result, puffiness and under-eye dark circles diminish significantly in size and visibility.